By all rights, Johnny Manziel should have engraved his name on the Heisman Trophy yesterday. He quarterbacks one of college football's most archetypal brands, the Texas A&M Aggies, and has had an outstanding season running the nation's most demanding gantlet, the Southeastern Conference. 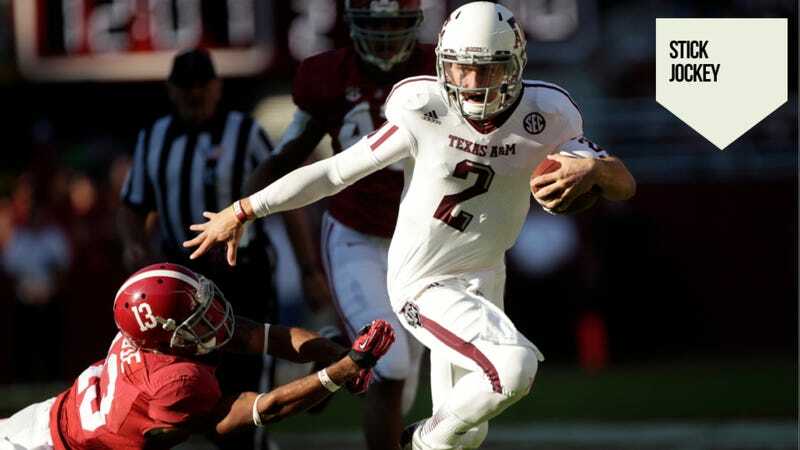 On Saturday he and A&M deposed Alabama, the No. 1 team and defending national champion, on its home field, in TV's game of the week. He was captured in two dazzling Heisman-pose photographs that will likely make their owner a ton of money. And then there's that winning smile of a nickname, Johnny Football. Whatever you feel about him or his team, his story this year has every component in place for a landslide Heisman candidacy except one: Manziel is a freshman. Freshmen do not win the Heisman Trophy. A freshman winning the Heisman is about as commonplace as Idaho or New Mexico State winning the national championship. Which is to say it happens all the time—in video games. Yesterday CBS Sports aired an amusing highlight package, complete with Super Mario Bros. sound effects, equating Manziel's preternatural ability with feats seen only in video games. It's meant as a compliment, and when you fumble the ball, recover it in midair, and still hit your receiver in the endzone, the whole thing is so implausible that the only precedent for such an outcome is, yes, a video game, where this seems to happen all the time. But observing the aftermath of A&M's 29-24 triumph over Alabama, and contemplating Manziel's ascendancy, it strikes me that CBS is both right and wrong about him. Manziel is indeed a video-game performer in real life, but not for what he is doing in a single play or a game. It's more for the uncommon season-long narrative in which he currently stars. It's been a while, but I do remember winning the Heisman with a freshman playing in NCAA Football. In fact, NCAA Football 10 offered an achievement/trophy for winning the Heisman as a freshman in Road to Glory, the singleplayer career mode rebooted that year. Today, I called an EA Sports producer just to verify there still was no prohibition on first-year players carrying off the award. Nope. "If you have the résumé, you can win as a freshman," said Ben Haumiller. In that regard, Haumiller's video game, the tableau for every inhuman feat and improbable result that inspired CBS' comparison, is more egalitarian than real life. Many Heisman voters simply won't pick a freshman first on their ballots for the same reason Hank Aaron wasn't a unanimous selection to baseball's Hall of Fame—blind adherence to stupid unwritten rules. I don't mean to suggest Manziel is a lock but for his year of eligibility. Kansas State and Oregon both have offensive performers who are solid contenders; Notre Dame, whose name sways a lot of interest in a beauty contest such as the Heisman, even has a defensive player in contention. All three of those teams are undefeated, and being the most notorious player on a national championship contender counts for a lot in this race. Little of this actually matters in NCAA Football 13, particularly for a player under your command. Manziel now has 3,974 yards of total offense with two games left, and will easily surpass the total Florida quarterback Tim Tebow posted in his Heisman-winning year of 2007, the first time a sophomore won the trophy (and first of three straight years that sophomores did so). Put up those numbers in NCAA Football 13, regardless of your player's class, and you're a front runner for the award. For players that the CPU simulates in the Dynasty or Road to Glory season surrounding yours, it's unlikely, but still not impossible, that a freshman could be in legitimate Heisman contention at year's end. "Most freshmen in the game are not rated as high as those that are upperclassmen in contention for the award," said Haumiller, who added that the game generates 10 Heisman contenders each season in its Dynasty mode, of which five are displayed in the news menu. "So, the few that are starters are at a ratings disadvantage," Haumiller said. "The human factor erases that disadvantage, which makes a human frosh more likely than a CPU frosh to win." I'd argue that this is a deliberate conceit of sports video games' career modes, or the background narrative they're obligated to supply, anyway. You pay the $60, you expect to be The Man for your favorite team, and the game had better indulge that. The computer-controlled league is supposed to play out according to type. The favorites are supposed to win, the typical all-stars must shine. The No. 1s must stand up to be knocked down. That makes the miraculous ascent you concoct, in defeating or joining these names, so thrilling and enjoyable. That's the story in which Johnny Manziel, freshman, of Texas A&M finds himself today: a backyard daydream glowing on the living room TV, a true video game hero brought to life.